Preheat the broiler. Line a baking sheet or roasting pan with foil. Place the whole tomatoes, onion and unpeeled garlic cloves on the foil and set under the broiler, 3 to 4 inches from the heat. Broil for 4 to 5 minutes, until charred on one side. Flip over and broil for another 4 to 5 minutes, until the skin is blistered and completely charred. The tomatoes should be very soft with the juices beginning to run out. Remove from heat. Once cool enough to handle, quarter the tomatoes and place in a blender jar along with any juices from the baking sheet. Peel the garlic cloves and add to the blender along with the onion, salt and 1 cup of the chicken broth. Puree until completely smooth. Heat the oil over medium heat in a casserole or soup pot until hot but not smoking. Pour in the puree and cover partially, as the sauce will sizzle and jump. Cook, stirring occasionally, for 7 to 8 minutes, or until the sauce thickens and darkens considerably. Meanwhile, combine the grapefruit juice, orange juice, lime juice, vinegar, oregano, cumin, allspice, pepper, chopped achiote paste, and the remaining cup of chicken broth in the blender and puree until completely smooth. Stir the puree into the tomato sauce and bring back to a simmer. Simmer 5 minutes, then add the shredded chicken. Mix together well and continue to cook, uncovered, until the chicken has absorbed most of the sauce, about 5 minutes. The finished dish should be very moist but not wet or soupy. 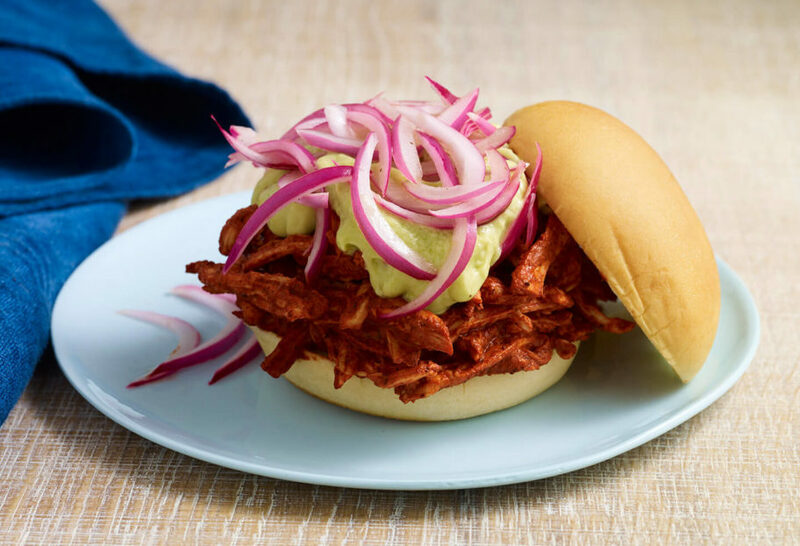 To serve, scoop about 1 cup of the chicken pibil onto the bottom half of a soft bun. Top with avocado crema and a few pickled red onions a la Yucateca. Cover with the top half of the bun to form a sandwich. You would need 4-5 times the amount of ingredients. And please say congratulations to your son! Yummy! Puedo server esta receta con tostadas en vez de pan? Pati una pregunta esta receta es tambien para sustituir con puerco? I just saw you on Australian Food Network for the first time and I’m so inspired and hungry for your chicken pibil sandwich! Love your accent and your passion for amazing food…thank you. Magick! Oh thank you so much Jen! Thanks so much for this inspiring recipe! I like to buy my achiote paste pre-made…there are great brands directly from the Yucatan that make a delicious paste. I hope you have fun making the paste and enjoy the sandwiches, Jacque! The homemade achiote past turned out great and the sandwiches, too! I hot smoked chicken thighs and tenderloins on our grill, adding that to this delicious recipe. It was a big hit at my daughters graduation party. Doesn’t quite qualify as ‘fast track’ but all could be prepared in advance then placed in slow cookers for the event. Wonderful combo of flavors! Absolutely a keeper of recipe! Awesome! And congratulations to your daughter on her graduation! This episode just played here in Australia, my husband love and I watch regularly. I missed the ingredients for the pickled red onion and was wondering if you please tell me what you put in to make the pickle. Here is the recipe, Toni…https://patijinich.com/recipe/pickled-red-onions-a-la-yucateca/ Enjoy! I have the ingredients to make this on the weekend for the family. Exactly! I hope you enjoy them! What brand of Achiote paste do you use? I can’t seem to find it in my small town. Could I go to a Walmart store? You want to look for achiote paste from Yucatecan brands like Anita or El Yucateco or ORALE. Or something that says from Yucatan. Making this right now. My kitchen smells amazing. Hahaha! Thank you for your awesome comment Cecilia! I love your Show, Your show is the only cooking show I’ll watch, You remind of an old friend who looks similar to you and loves to cook to. Anyways I wanted to share my opinion to you When your cooking you make it look so easy to do. My buddies and I were watching the game earlier I made your Famous Chicken Pibil Sandwich and they loved them just like me. Anytime I’m having a party they will be on the list. That’s too funny! I’m glad I remind you of your friend…and that all of your friends enjoyed the sandwiches! Could you not become the Mexican American ambassador and try to win our government’s representative’s through their hearts and stomach’s? I live in Texas and I love to cook and I love your show. I wish there was some way that women and mother’s could bridge the gap. I’d vote for you anytime to represent us. I would LOVE to, Susan! I Love your show I watch your show each night the Pibil Sandwich is yum and many other things I’ve tryed to make. I was watching the show, and I had to run here to get this recipe… Mexico is in my life, part of my family live there. I love the way you do your program… So natural, entertaining and warm. I also like your beautiful family, we have a girl and a boy, and I love and really enjoy cooking for them. Thankyou for give us good moments watching your show. Thank you so much Eddy! I’m so happy you and your family watch the show! Pati… desde la primera vez que vi tu programa, que fue cuando preparabas los camarones con coco… quedé fascinada, a los pocos días estaba usando tu receta y recomendaciones especialmente para el empanizado y coco… fueron todo in éxito. Pero además de tus deliciosas recetas, gozas de gran simpatía y todo en el programa es de gran calidad, veo que cuidan muy bien todos los detalles de producción… realmente pones el nombre de México muy en alto y nos enorgulleces a todos los mexicanos que estamos en E.U. Que sigas cosechando muchos éxitos más. Bendiciones. Gracias por tu mensaje tan lindo Patricia. Significa mucho para mí. Love you…love your show! Your heart of gold “oro”(?) shines through every episode. My husband actually bought me a comal yesterday, because I have told him how much I love your show, i.e. the customs and/or differences of the U.S. and Mexico, and how you have shared your beautiful family and traditions with us. I am excited to try your chicken pibil recipe, and have purchased some of the ingredients; although, if you heard me pronounce them, you would have a great laugh! Thank you so much for sharing the sights, colors, and flavors of Mexico with us. I look forward to every episode. Wishing you and your family the best, always! What a lovely message Annie…thank you so much! I hope you love your comal as much as I do. I’m so excited to share more of Mexico with you in season six. There are many brands that sell it…but you should look for the ones that say Yucatecan or from the Yucatan. This is simply delicious. The flavors are so well balanced. I used pain au lait buns. Wouldn’t change one thing. Thank you so much Jan.
Hi Patti, just saw your recepie for your Delicious chicken pibil sandwich which looks amazing can’t wait for my kids to try them. Since I have a little mexcican in me by my father’s side, never met them though, I just love watching your show. Thank you for all that you share!! Dips the bendiga! Janet, I hope you and your kids enjoy them! I just went and bought all the ingredients to make this. You make food look sooooo good. I hope you enjoy them Penelope. I just made this. I did use a fresh whole raw Chicken, cooked it in the fabulous sauce, then shredded the meat and put it back into the sauce. The whole house was happy! It was very remeniscent of eating in the Yucatan. Several steps, but so very worthwhile. This is a keeper recipe! This episode was wonderful. I have always wanted to go to the Yucatan. This recipe looks so good! Going to try it tomorrow- Is there a non dairy substitute for Mexican Creme I can use for the avocado sauce? My husband can not have dairy….. I recommend you skip the crema and make it more like a guacamole…or you can try vegan mayonnaise. I’m going to try this on mothers day for my mom and also someday you should make an episode with vegan Mexican food. Your show is my favorite ! (: ? Hi Patti, I love yucatan flavors. Especially la cochinita pibil. For health reasons I have recently gone to a plant strong diet. Do you think that jack fruit would work well in place of the chicken? Thank you! I love your show! I bought two bars of achiote paste in a market while in Progresso almost two weeks ago. It’s not pre-packaged and was made by the market vendor. It’s just wrapped in plastic wrap. I brought it home to New York with me and I want to try this recipe. How long does achhiote paste keep, and does it need to be refrigerated? ​The paste should last for at least year, as long as it is stored in a shaded area that has no humidity and is sealed well. I would love to try this recipe soon. ..I’m just wondering what achiote paste is made of. Are there multiple ingredients in it, and if so, which ones? Could you make this with achiote powder? Apologies in advance for how lengthy this is: For some unknown to me reason I have never made anything from the show though I watch regularly (and I have the tamaliza episode still sitting on my DVR from over a year ago just to inspire me to finally make tamales and the casserole version). I also don’t normally make new (to me) recipes for others before trying them myself but when I saw this I knew I had to try it out. Living in a suburb of Los Angeles, we have many Hispanic markets nearby so getting the achiote paste and a bottle of naranja agria was not a problem at all and I already had everything else on hand. This meal was a HUGE hit and after 1, maybe 2 bites everyone said this is something to add to the “definitely make again” list. I made a few very small changes: I cut open the jalapeno for the pickled red onions and I think next time will use serranos instead for some more heat. I also added a bit of white vinegar too as we like pickles that pack a punch. Also, instead of the avocado crema we used guacamole with a ton of fresh and roasted jalapenos (needed to use up the guacamole and this seemed a good way to do it). I think the only issue I had was that I figured the recipe as is would not be enough for our group (plus the mandatory leftovers) so I had about 16 cups of chicken (3 whole rotisserie chickens) and made 1.5x the recipe for the sauce and the chicken was still soupy. Not, like, actual soup but very wet and this is even with reducing the sauce before adding the chicken. Next time I will stick with the recipe as is for the sauce amounts and will reduce them even further before adding the chicken. Even with this it was still outstanding as a sandwich, over a salad, as a soft taco filling, standing at the stove picking at it as it cooked … 🙂 On the side I served the chayote, jicama and apple salad from a different episode and for dessert I served some various pan dulce I bought at the market. Long story short: a great meal that was mostly from your show(s). Thank you! Susan thank you so much for sharing your story with me. It sounds like an epic meal and I’m super happy everyone loved it! Going to make these very soon! I just recently purchased one of your cook books! Just waiting for it to be here! Soooo excited! Love watching your show! You are an amazing cook! Thanks, xoxo. Melissa thank you so much for purchasing my book and watching the show…it means so much to me. This came out really good. Love the tangy taste of the chicken. Made the pickled onions also but used habaneros, and mango guacamole. Thanks for the recipes!!! Immediately purchased the ingredients to make this right after watching this episode! So inspiring! Thank you! Gracias Ariel…hope you enjoy it! I’m part of a cast iron group on Facebook and we have a bi-monthly cookoff. I watch your show with my soon to be 81 year old mother (she LOVES your show) and wanted to make this for the cookoff. Can’t wait to get it done. Good luck in the cookoff Louis! Made it. Loved it and your onion pickles too. Wonderful! So happy you loved them. Going to make this tonight! Thanks for all that you do. I hope you enjoy them Richard. I love your program and the mexican food. I will try to make this sandwich. My wife and I watch Create every night and we love it when you are on there. Your enthusiasm and the wonderful tips and recipes are awesome. Thank you so much Bob and Nancy! Where do you purchase the achiote paste? This looks sooo good. I will make it for company soon. Thanks. Migdia.